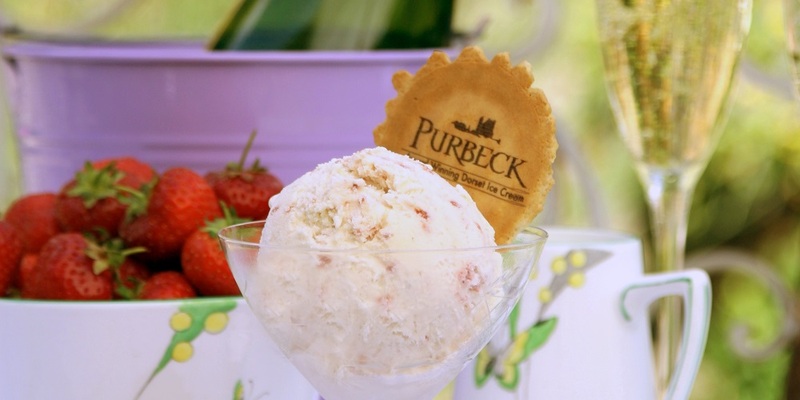 We’ve found the best ice cream makers in Dorset for you to try. Next time the sun’s out, why not cool down with a taste of Dorset’s finest ice creams, gelatos, sorbets and milkshakes? This award-winning ice cream is produced by Hazel, Peter and team on their farm in the lush green hills directly opposite the historic remains of Corfe Castle in the heart of Dorset. 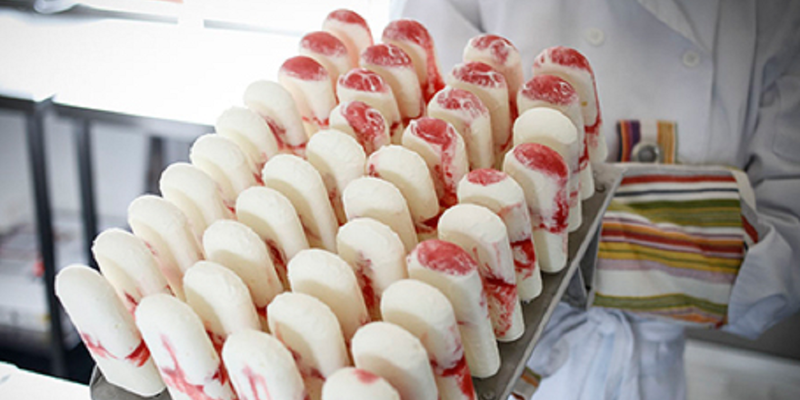 They use local fresh milk, thick double cream and an abundance of delicious natural flavours to make over 40 different flavours. Try classics like decadent Clotted Cream and Raspberry Ripple, as well as more adventurous Dorset Truffle, Chai Latte and Great Taste award winner Salted Maple. They use local ingredients wherever they can including local honey and fellow Dorset producer Tracey Collins’ homemade marmalade. Children will love their Jurassic Range; ice cream with milk chocolate dinosaurs, fossil ammonites, trilobites or footprint fossil shapes. These Jurassic ice creams give back to the local community too, as 5p from every tub goes to the Jurassic Coast Trust, to help to protect, conserve and educate people about the Jurassic coastline. Why not try their sorbets too? Langham Rosé Fizz Sorbet and Rhubarb and Rosehip will be sure to tickle your tastebuds. Run by Annie Hanbury, a trained gelatiere who studied at Gelato University in Bologna, Italy, Baboo Gelato is a magical mix of delicious Dorset ingredients and Italian know-how. After living abroad for most of her life, Annie came to Dorset and found a smallholding with an overflowing and abandoned market garden in the rolling hills near Bridport. She uses the abundant fruit from her garden and local suppliers like Forde Abbey, milk from West Country dairy farms and ingredients like vanilla and chocolate from trusted suppliers to make gelato, lollies, sorbets and baboo; bite-sized ice cream and sorbet wrapped in chocolate. The awards speak for themselves: Champion Ice Cream and Sorbet 2016 by Taste of the West for her lemon sorbet; Best Dairy Producer by Taste of Dorset; and gold stars from The Guild of Fine Food 2016 for her raspberry sorbet and pistachio gelato. You can find Baboo Gelato at local restaurants, cafes, farm shops and delis in Dorset and Somerset, as well as at their kiosks in West Bay and Lyme Regis. Another taste of Italy, this time found in Bournemouth, Poole and Swanage, Giggi Gelateria was voted The Times sixth best place in the UK to eat ice cream and number one on the south coast. It’s safe to say Luigi (Giggi) Bray really knows his stuff. He grew up in the region of Puglia, in the heel of Italy’s boot, and moved to the UK, via Australia. While he could find many tastes of home in England, he could not find real homemade Italian ice cream. He set his sights on opening an ice cream parlour with his brother Andrea, and fell for a spot in Burlington Arcade, Bournemouth. They make their ice cream every day on the premises using local dairy products, local seasonal fruit and flavours from around the world. They have 22 flavours of ice cream and nine dairy-free sorbets. We love the sound of their frappés – three scoops of ice cream blended with ice cold milk to make the best Milkshake Italiano. They can also supply parties and weddings, including ice cream wedding and celebration cakes. True farmhouse ice creams and sorbets made at Barford Farm on the National Trust’s Kingston Lacy Estate. Enjoy a scoop or two in their peaceful ice cream garden during the spring and summer months (check their website for dates and times). Very close to the River Stour, Barford Farmhouse Garden is a tranquil place, full of little nooks and spaces to sit. And you can take a tub home with you too, from the on-site ice cream shop.